This bell charm is consisting of 9-bells (3 bells in each layer), pagoda shape and pi yao on the top. Hanging such charm bell at home can ward off bad spirits, purify environment and transfer bad energy into good energy. Feng shui pi yao is the one of the auspicious animals to attact money luck and good fortune. It is also the feng shui animal to appease Tai Sui. The bell charm has nice sound when you shake it. 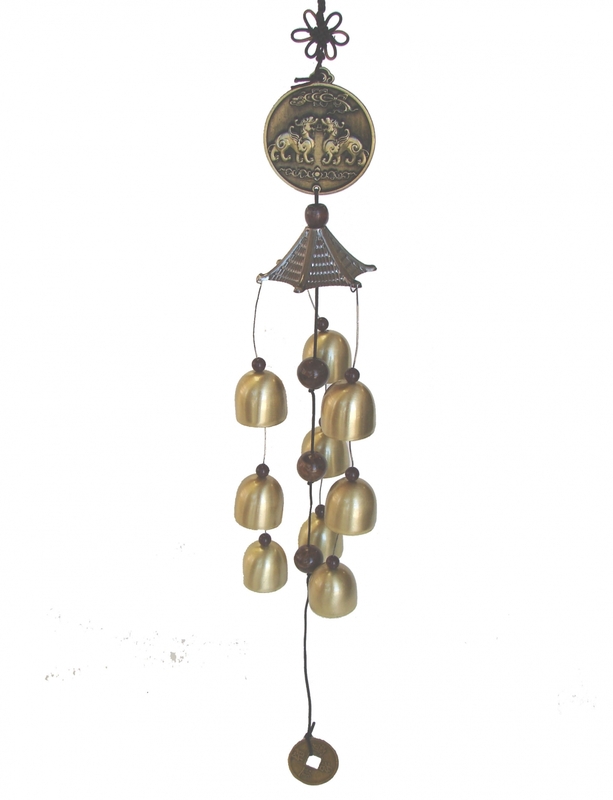 The overall length of the bell charm is approx. 21.5". The dimension of each bell is approx. 1 1/16" x 1 1/16" x 1 1/8". The dragon itself is approx. 2 1/2" x 2 1/2". They are made of metal.